Find trained pets around Skyrim. Read the For Sale notice at The Bannered Mare. 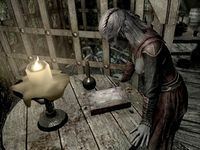 Purchase a goat in Rorikstead for 200 gold and read Halvar's Journal. Locate the tame fox south of Half-Moon Mill and feed it a sweet roll. Locate the rabbit at the Alchemist's Shack and feed it a carrot. Kill the Vampire Naturalist in Cronvangr Cave and rescue the tame spider. This quest will begin upon installing the Pets of Skyrim Creation. 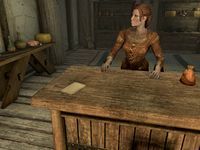 You will be directed to The Bannered Mare in Whiterun, where a For Sale notice can be found at the counter. It is advertising for the sale of Hilda, a trained pack goat in Rorikstead. Journey to Rorikstead and locate Halvar in order to purchase the goat. Halvar is a farmhand who can be found working the field beside Cowflop Farmhouse. He will sell Hilda for 200 gold, at which point it will act as your follower and can be given various orders such as instructions to wait at a specified city or player house. Upon purchasing Hilda, you will be prompted to read Halvar's Journal to find out more about the goat. It can be found on Halvar's bedroll next to the field. Reading it will reveal that Halvar had come across many other tame animals in his travels, and your journal will update with objectives to track down each of them. They can be found and rescued in any order you wish. 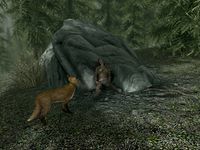 In the forest south-southwest of Half-Moon Mill, you will come across a collared fox named Sweet Roll standing over the body of a Bosmer thief. The thief was evidently killed by wolves, evidenced by the scattered arrows and wolf carcasses surrounding him. His body can be looted for some ill-gotten treasure as well as the Thief's Journal. Reading the journal will reveal that the fox has a penchant for sweet rolls (thus the name). It will refuse to interact with you until you have a sweet roll in your inventory, at which point you can feed and tame it. Fortunately, the thief has five sweet rolls on his body. A tame rabbit named Thistle can be found at the abandoned Alchemist's Shack in the mountain pass south of Ivarstead. The nearby Notes on Tamed Rabbit will reveal that Thistle enjoys carrots. A trough of carrots can be found right next to the rabbit, making it a simple matter to feed and tame it. You will be led to the hidden vampire lair within the spider-infested Cronvangr Cave in order to obtain a pet frostbite spider named Arachnia. It has been tamed by a Vampire Naturalist, who is using it to harvest vast amounts of venom for the purpose of torturing her victims before she drinks their blood. Kill the vampire and loot the Spider Cage Key from her corpse in order to free Arachnia from its cage. You can also loot the Vampire Naturalist's Journal for some background information on her experiments. Once the cage is opened, Arachnia is yours. Within the Ratway beneath Riften, you will come across a tame skeever named Skritch found locked in a cage. You can find the body of its owner just across from the entrance to The Ragged Flagon: a failed Orc pickpocket who planned to catch skeevers for food but decided to train one instead for use as a distraction. 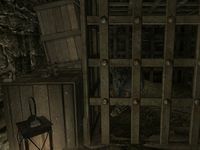 Loot the Skeever Cage Key from his corpse and open the cage in order to rescue Skritch and claim the animal as your own. You can also read the Pickpocket's Journal for optional background information. Once you've obtained the last of the 5 pets, the quest concludes. Like other Creation Club pets, each one can obey a range of orders and each also has its own distinct attribute. [verification needed — what are they?] The pets can also be equipped with an Animal Collar or an Animal Pack, two items added by Pets of Skyrim; indeed, Hilda is already wearing a pack, and Sweet Roll a collar. The For Sale note, Halvar's Journal, the Notes on Tamed Rabbit, and the Thief's Journal all remain marked as quest items even after the quest ends, resulting in them being stuck in your inventory permanently. 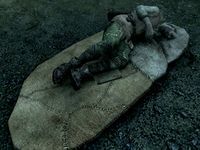 1000 The journey through Skyrim can be hard and long, and I could use the companionship of a loyal animal. I should inquire in town to see if there are any tamed animals for sale. 1010 I found a notice in the Bannered Mare offering a tamed goat for sale. I need to talk to Halvar in Rorikstead to purchase it. 1050 Finishes quest After reading Halvar's journal on his adventures throughout Skyrim, I've discovered that there are many other tame animal companions out there in the wild. I should set out to find them. The following empty quest stages were omitted from the table: 0, 20, 120, 220, 320, 420, 520. On the PC, it is possible to use the console to advance through the quest by entering setstage ccVSVSSE002_MainQuest stage, where stage is the number of the stage you wish to complete. It is not possible to un-complete (i.e. go back) quest stages, but it is possible to clear all stages of the quest using resetquest ccVSVSSE002_MainQuest. This page was last modified on 1 January 2019, at 18:06.